"Creamy egg salad with a little tang." Chop eggs and transfer to a large bowl. Stir mayonnaise, Dijon mustard, sweet pickle relish, steak sauce, paprika, and dill into eggs until well mixed; season with salt and black pepper. Cover and refrigerate until chilled, if desired. Sprinkle with cayenne pepper before serving. This recipe was awesome, I intended on sharing with a friend, but ended up eating all myself! This is an excellant recipe. The only change - I added some chopped onion. I loved the extra flavor the mustand and the stake sauce gave it. I am sure I will be making this again. 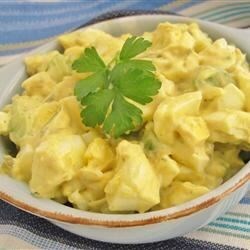 Fantastic egg salad! Pretty close to how I normally make it, but the addition of the Worcestershire gave it that little extra something. Will make this version from now on!